Warner Bros. couldn't have imagined when they set out to release their very family-friendly animated film Smallfoot, which is a twist on the Bigfoot myth, that it would come out at a time when Bigfoot erotica is part of the national conversation. Who knows? Maybe it will attract a whole new target demo they weren't planning on? Maybe separate screenings for families and deviants? Eh, probably not, and this new trailer for the film looks totally innocent, anyway, so nothing to fear. 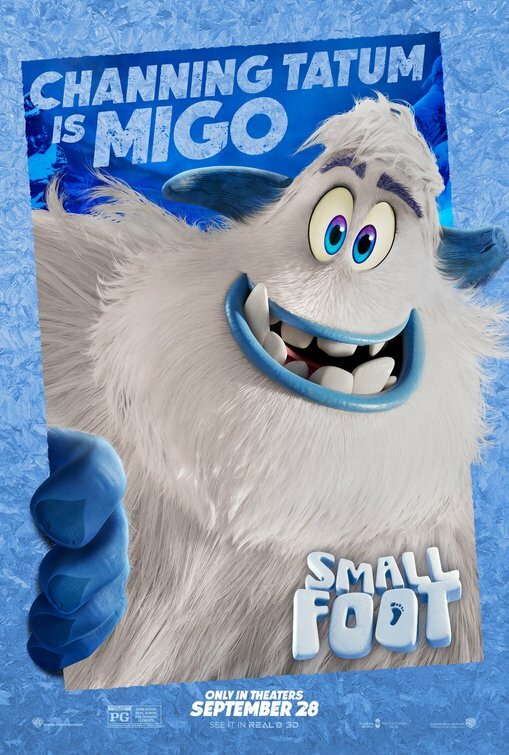 A total reversal of the familiar myth, Smallfoot features the voice of Channing Tatum as Migo, a yeti who discovers that humans, the Smallfoot, actually exist. Unfortunately nobody believes him except for a small group of conspiracy theorists, so Migo has to find the human, who is voiced by James Corden, and prove he's real. Let the buddy adventure through the snowy mountains begin. I kinda wrote off this film as one to be ignored but have to admit this trailer won me over. It's a really fun idea with a lot of comedy legs to it if done right. I might actually go see this and not pawn it off on somebody else. Featuring the voices of Zendaya, Common, LeBron James, Gina Rodriguez, Danny DeVito, Yara Shahidi, Ely Henry and Jimmy Tatro with Karey Kirkpatrick (Over the Hedge) directing, Smallfoot opens September 28th.